Heifer International will host the 2nd Annual “Beyond Hunger: A Place at the Table,” gala event on September 19, 2013 at the Montage Beverly Hills Hotel in Los Angeles. This year the event will honor Academy Award-winning actress, Susan Sarandon, for her commitment to Heifer International in its efforts to end world hunger and will feature a performance by country music trio, The Band Perry. The event will be co-hosted by Geena Davis, Jon & Kirsten Heder, Eva Amurri Martino & Kyle Martino, Ian Somerhalder, Dr. Heather Richardson, Laura Turner Seydel and Keisha Whitaker. Proceeds from the evening will directly benefit Heifer’s mission to end hunger, poverty and protect the Earth. 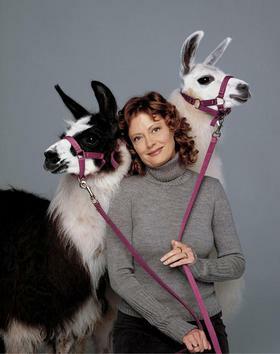 Demonstrating her commitment to promoting and advancing the mission of Heifer International, Susan Sarandon advocates for Heifer through field visits, events and speaking opportunities. In 2011, Sarandon traveled with her daughter, Eva Amurri Martino, to Cambodia to witness first-hand Heifer’s fieldwork including participating in a Passing on the Gift ceremony where families pass on the first female livestock offspring to another community member in need. “I have followed and supported Heifer International’s work with women and their families for more than 20 years. I had the chance to see Heifer’s work in person in Cambodia, and see the importance of Heifer’s transformational work with women. Women, particularly in poor rural communities, really are the ‘glue’ and the key to ending global hunger and poverty,” said Susan Sarandon, this year’s honoree. Making the evening even more unforgettable, guests will be treated to a performance by country superstars, The Band Perry. The Band Perry – comprised of siblings Kimberly, Reid and Neil Perry – first gained recognition with their #1 hit “If I Die Young,” which went quadruple–platinum and captured the attention of the mainstream music audience as well as country music fans. Since then, the trio has won numerous awards and notched a string of hits, including their most recent #1 singles “Better Dig Two” and “DONE.” from their latest album PIONEER, which debuted at #1 on the Billboard Country Chart and #2 on the Billboard Top 200 Chart in April. Later this year, the band will embark on their first-ever headline arena tour, including stops throughout Europe, Canada and the U.S.
Heifer International works with smallholder farmers in more than 40 countries, providing gifts of livestock and training to empower self-reliance and ensure nutritional and economic security. Since 1944 Heifer International has assisted more than 18.5 million families — 79 million people — move from poverty to prosperity with the help of supporters including Susan Sarandon. Heifer project participant families are trained in eco-friendly agriculture and how to properly care for their livestock and living assets, to improve not only their lives, but their communities as well. In turn, Heifer families agree to “Pass on the Gift,” by presenting the first female offspring of their gifted livestock–and the training in its care–to another family in the community. With that, the gift of a single goat can soon become four goats, then eight goats, then 16 goats, helping even more families struggling daily to escape hunger and poverty. This not only extends the impact of the original gift, it allows a once impoverished family to become donors and full participants in their community’s sustainable development. For Heifer International, women are the backbone of agriculture, and the key driver of food production. Worldwide, women farmers outnumber male farmers by a few percentage points. However in developing regions, the figure is much higher. In Sub-Saharan Africa and South Asia, 60 to 70 percent of farmers are women. Given help, tools and training to enhance food production and the chance to build assets and income, these women will help feed the world. This year’s dinner committee is comprised of an outstanding list of prominent entertainment figures, including: Jeff Bridges, Mehcad Brooks, Janie Bryant, Ty Burrell, Colbie Caillat, Ted Danson & Mary Steenburgen, Mia Farrow, Mark Feuerstein, Jane Fonda, Amanda Fuller, Nina Jacobson, Allison Janney, Jane Kaczmarek, Billie Jean King, Diane Lane, Bonnie Raitt, Jimmi Simpson, Octavia Spencer, Ashley & Ryan Stone, Serinda Swan, Michael Welch, Forest Whitaker, Dan Zanes and Josh Zuckerman. The event will be sponsored by Yamaha Entertainment Group of America, Poe Travel, and Variety. To purchase tickets to the event, please visit: heifer.org/beyondhunger.